The CRCICA Caseload for the entire year 2017 has been published at the Global Arbitration Review (“GAR”) Indeed, 65 new cases were filed during 2017 compared to 91 new cases in 2016. Accordingly, the total number of arbitration cases filed before CRCICA until 31 December 2017 reached 1226 cases. In 2017, disputes arising from construction and other contracts for works (such as contracts for implementation of electro-mechanical works, etc.) ranked on top, with 32 % of the total number of cases, followed by lease agreements, media and entertainment and other contracts for supply of services. 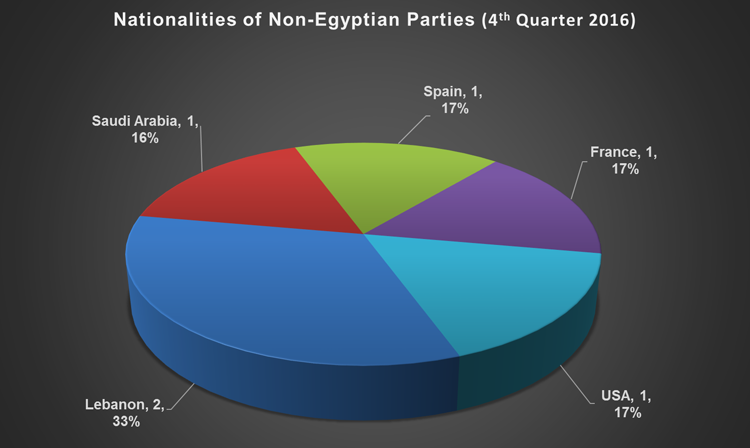 Parties from Saudi Arabia ranked on top of Non-Egyptian parties referring their disputes to the Centre followed by parties from Spain and the U.A.E. At the third rank came parties from Singapore, Netherland, Italy, India, France, the United Kingdom and Barbados Island. 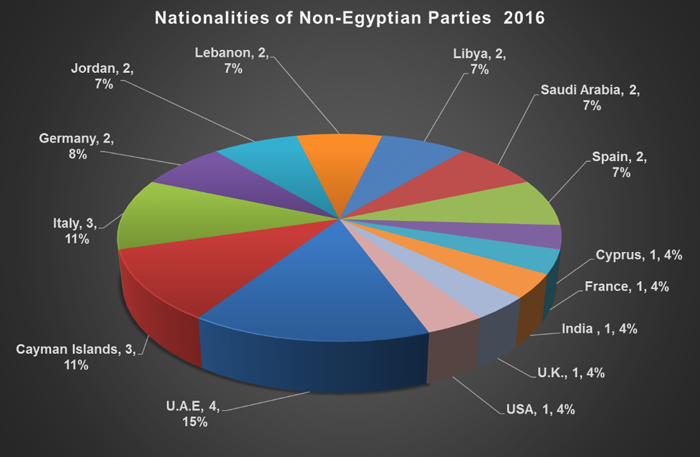 It is worth noting that the above statistics are very conservative as they do not include Egyptian joint stock companies owned or ultimately controlled by non-Egyptian shareholders. 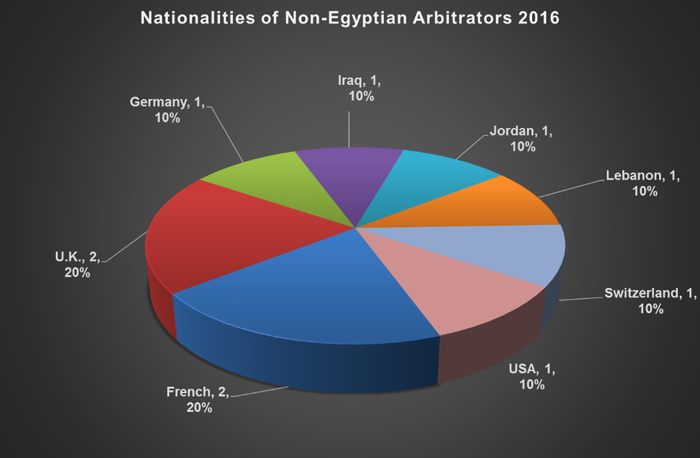 2017 also witnessed the appointment of arbitrators coming from Egypt, France, Italy, Lebanon, Nigeria, Spain, Sudan, the United Kingdom, and the USA. With this regard, the year 2017 has witnessed the signature by the CRCICA of the Pledge for Equal Representation in Arbitration 2017, by virtue of which the CRCICA, taking into consideration the interest of the parties, the nature of the case and the interest of arbitral justice, implements a regional, gender and age diversity policy when it acts as appointing authority. Accordingly, diversity is taken into consideration when the Centre is invited to appoint directly arbitrators instead of a defaulting party and when the Centre proceeds to appointments through communication to the parties of identical lists including the names of at least three arbitrators, according to Article 8.3 and 9.3 of its Arbitration Rules. The said lists usually include the name of a competent female arbitrator or a competent arbitrator under the age of forty or from a region where competent arbitrators merit a closer look and were traditionally less appointed compared to arbitrators from other regions. 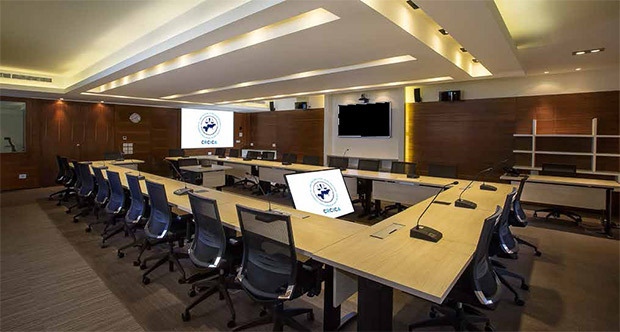 The “identical list” procedure, in accordance with articles 8(3) and 9(3) of the rules is viewed by the CRCICA as mean of involving the parties themselves in the process of appointing the sole or presiding arbitrator. In implementation of this diversity policy, the CRCICA has appointed in 2017 notable Nigerian and Sudanese arbitrators and one female arbitrator in cases where it was acting as appointing authority. A number of 5 arbitrators under the age of forty were also appointed by the CRCICA for their first time in various cases during 2017. In 2017, Arabic was the language of arbitration in 48 cases while English was the Language of arbitration in 17 cases. Having launched the French version of its Arbitration Rules in 2017 and having increased its French speaking personnel, the CRCICA is ready to administer cases in French in the coming years. 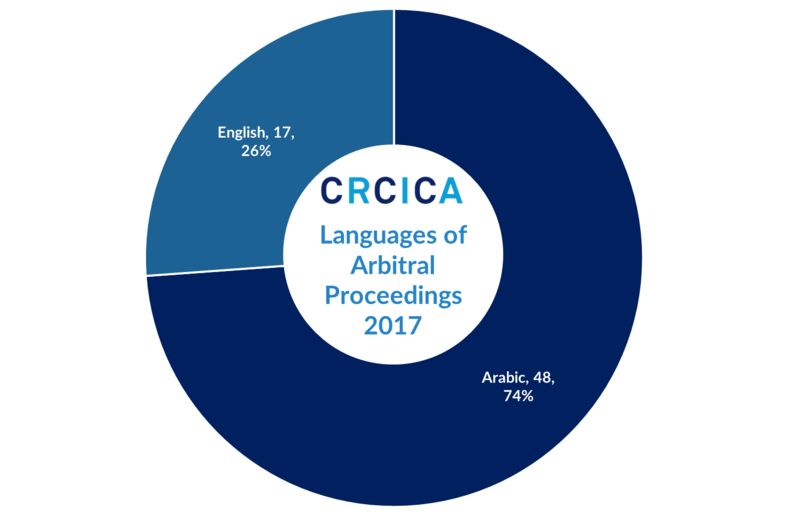 The percentage of cases in English vs Arabic as the language of arbitration in 2017 is illustrated in the figure below. The total number of arbitration cases filed before CRCICA until 31 December 2016 reached 1161 cases. In 2016, 91 new arbitration cases were filed, scoring as such 75% annual increase compared to the 54 cases initiated in 2015. 2016 witnessed a new record for the number of cases registered under the auspices of CRCICA in a single year (91 cases). The previous record, reached in 2012 (78 cases), has therefore been broken. 16 out of the 91 new cases were filed in the first quarter of 2016, while 23 cases were filed in the second quarter of 2016. The third quarter of 2016 witnessed the filing of 30 new arbitration cases, while 22 new cases were filed in the last quarter of 2016. 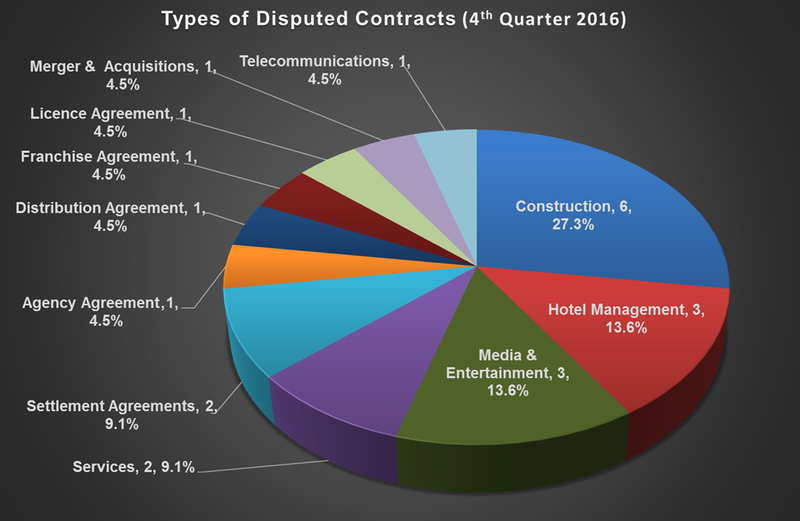 The 22 new cases filed in the fourth quarter of 2016 involved disputes relating to construction, media and entertainment, hotel management, services, settlement agreements, telecommunications, agency agreements, distribution agreements, franchise agreement, license agreement and merger and acquisitions. 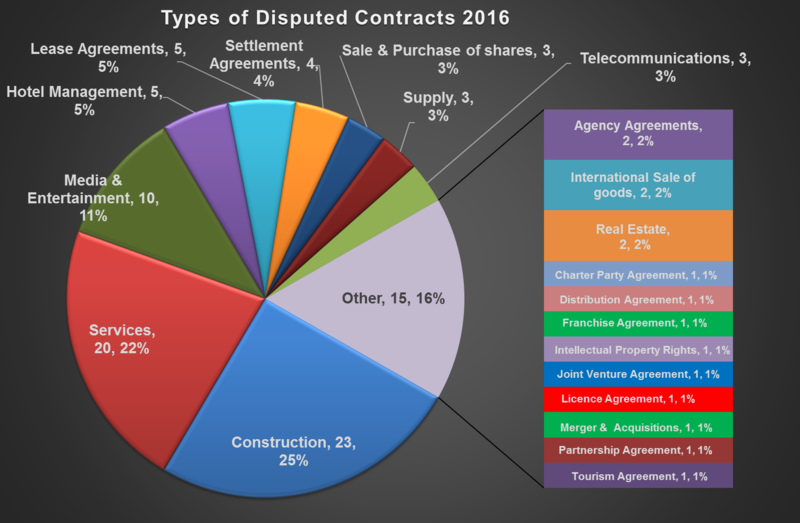 According to the statistics of 2016, construction disputes rank on top of the disputed contracts referred to the Centre 23 Cases followed by disputes arising out of services contracts 20 cases and media and entertainment 10 cases. Cases arising out of both hotel management and lease agreements filed in 2016 amounted to 5 cases each, while the number of cases arising out of settlement agreements amounted to 4 cases. Disputes arising out of sale and purchase of shares, supply contracts and telecommunications amounted to 3 cases each, while disputes arising out of agency agreements, international sale of goods and real estate amounted to 2 cases each. The remaining 9 cases filed in 2016 related to charter party agreement, partnership agreement, distribution agreement, franchise agreement, intellectual property rights, joint venture agreement, license agreement, merger and acquisitions, and tourism agreement 1 case each. 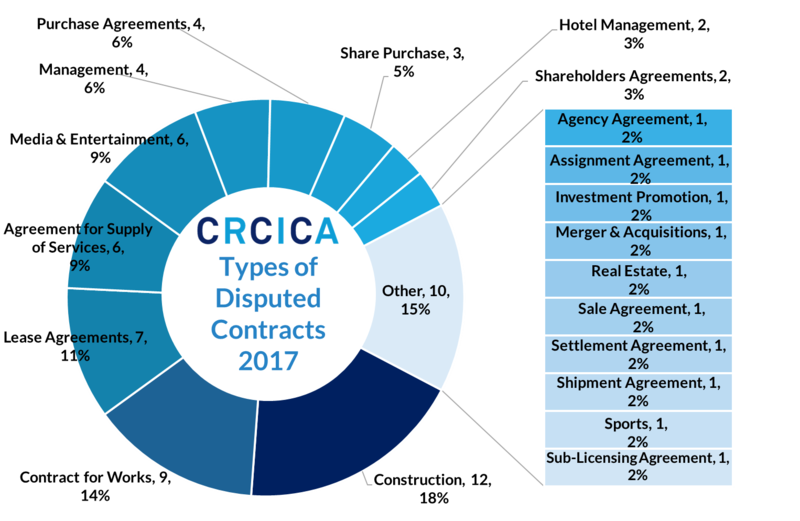 The rich variety of the types of disputed contracts referred to CRCICA in 2016 clearly illustrates the importance of arbitration as a means of dispute settlement and confirms the credibility of institutional arbitration under CRCICA's auspices. In the fourth quarter of 2016, arbitration proceedings involved parties from different countries including Egypt, Saudi Arabia, Lebanon, France, Spain and the U.S.A. According to the statistics of 2016, parties from the U.A.E. 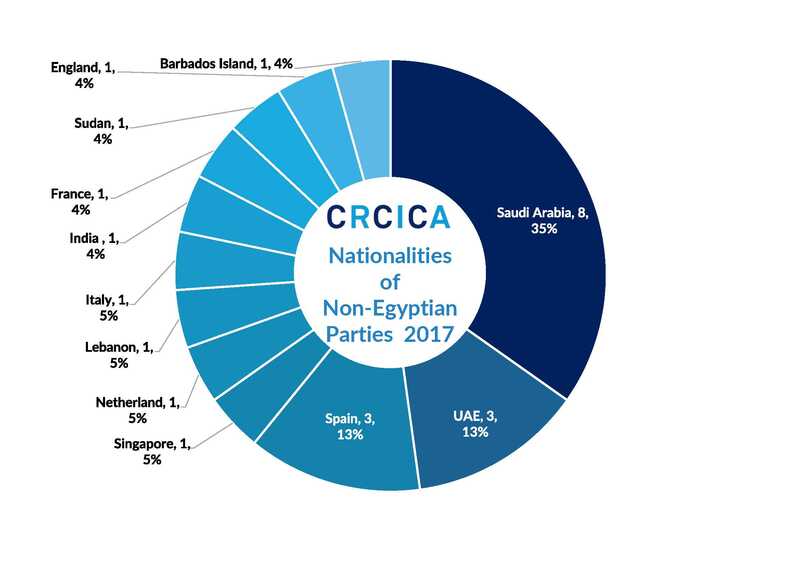 rank on top of the non-Egyptian parties referring their disputes to the Centre, followed by parties from Jordan, Lebanon, Libya, Saudi Arabia, the Cayman Islands, Italy, Germany, Spain, Cyprus, France, India, the U.K. and the U.S.A.
CRCICA is pleased to see that in 2016, its Arbitration Rules have been selected by parties to two purely international contracts (not involving any Egyptian party) concluded between parties from Saudi Arabia, Jordan and Libya. 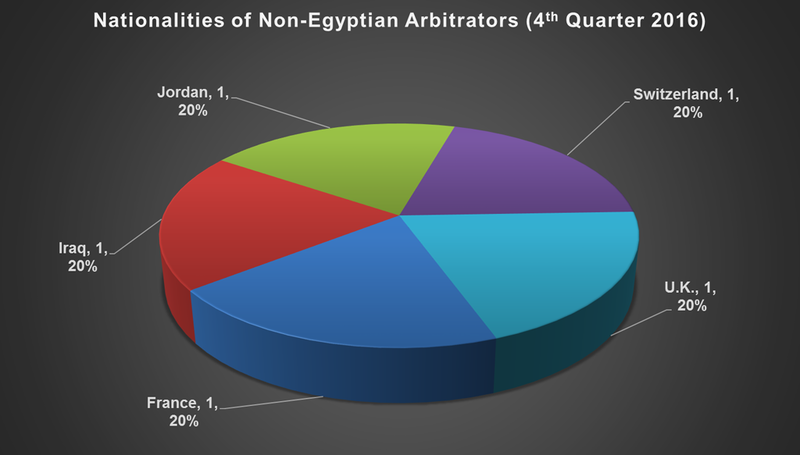 The fourth quarter of 2016 witnessed the appointment of arbitrators coming from Egypt, Jordan, Iraq, the U.K., Switzerland and France. 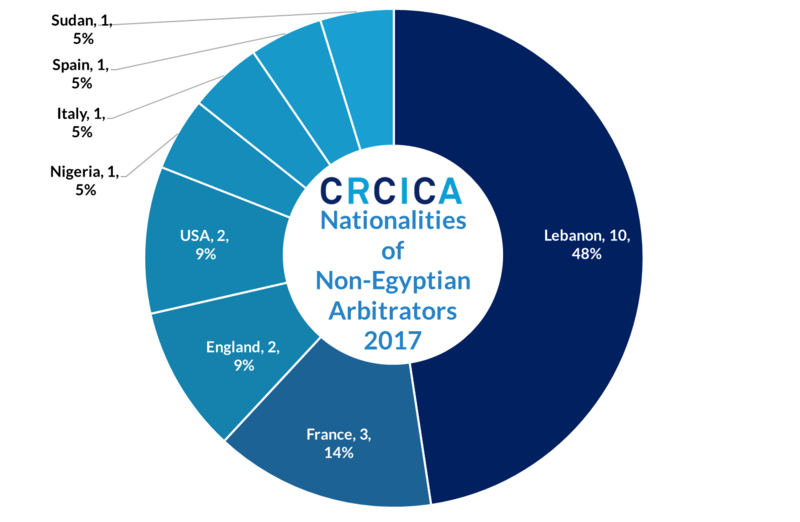 According to the statistics of 2016, arbitrators sitting in CRCICA cases came from Egypt, France, the U.K., Jordan, Iraq, Lebanon, Switzerland, Germany and the U.S.A. It is also worth mentioning that the fourth quarter of 2016 witnessed the filling of a mediation case concerning a contract for shipment of goods between two Egyptian companies.